G1.9+0.3 is the remnant of the most recent supernova in our galaxy. It is estimated to have occurred about 110 years ago in a dusty region of the galaxy that blocked visible light from reaching Earth, but it can be seen by x-ray telescopes such as Chandra X-ray Observatory. Astronomers estimate that a supernova explosion occurs perhaps a couple of times a century in the Milky Way. The expanding blast wave and hot stellar debris slowly dissipate over hundreds of thousands of years, eventually mixing with and becoming indistinguishable from interstellar gas. The Swift satellite uncovered the previously unknown remains of a shattered star during an X-ray survey of the galaxy’s central regions. The new object, named G306.3-0.9 after it’s coordinates in the sky,is among the youngest of the 300+ known supernova remnants in the Milky Way. Analysis indicates that G306.3–0.9 is probably less than 2,500 years old. That would make it one of the 20 youngest supernova remnants identified. This composite image of G306.3–0.9 (the blob in the lower left) was stitched together using data from Chandra X-ray observations (blue), infrared data acquired by the Spitzer Space Telescope (red and cyan) and radio observations (purple) from the Australia Telescope Compact Array. The image on the left was taken in February, 2011, using Swift’s X-ray Telescope as part of the Galactic Plane Survey. The dots in the image indicate where X-rays struck the detector. Despite this short 8.5-minute exposure, the extended circular patch of G306.3–0.9 stands out quite nicely. This cosmic puff ball is the remains of the brightest supernova in recorded history. In AD 1006, a supernova lit up the nighttime skies and was seen by observers China, Egypt, Iraq, Italy, Japan, and Switzerland. This image was assembled from data at three different wavelength of X-rays taken from orbit by Chandra X-ray Observatory. 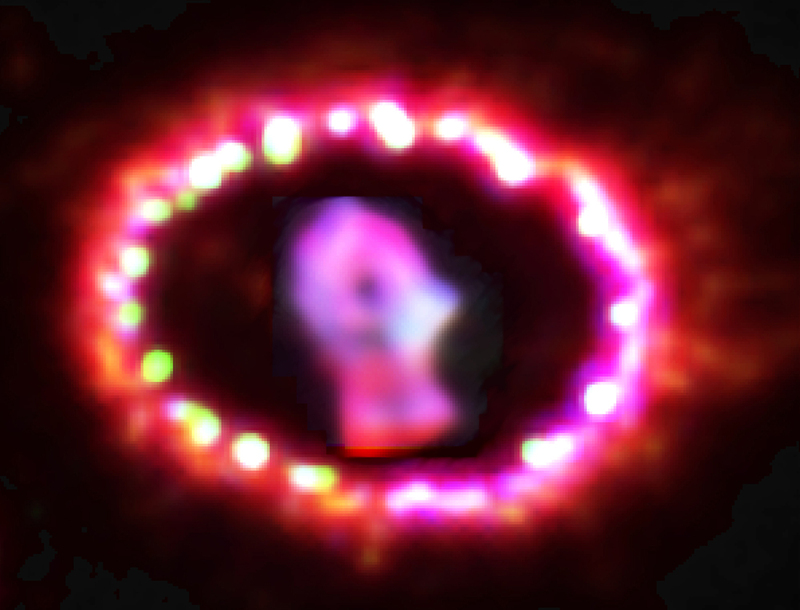 The debris cloud from what is now called the SN 1006 supernova remnant is about 60 light-years across. It’s the remains of a white dwarf star that was part of a binary star system. 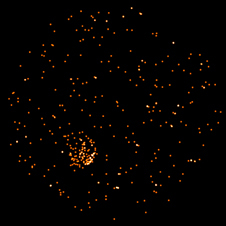 The white dwarf gradually captured ate its companion star, and the increase in mass caused a thermonuclear explosion. Because the supernova remnant is about 7,000 light-years away, that explosion actually happened 7,000 years before the light reached Earth in 1006, or in roughly 6000 BC. 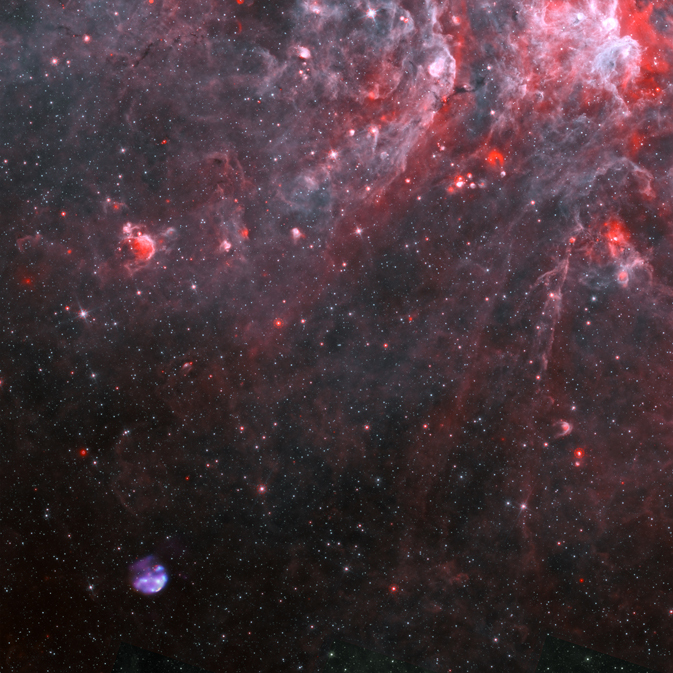 The thin, red veins of energized gas in this image from the Spitzer Space Telescope are the remains of supernova HBH3. The puffy, white feature in the image is a region of star formation. In this false color image, Infrared wavelengths of 3.6 µm have been mapped to blue, and 4.5 µm to red. The white color of the star-forming region is a combination of both wavelengths. The HBH3 filaments show up only at the longer 4.5 µm wavelength. In 1006 A.D., observers from Africa to Europe to the Far East recorded the arrival of light from what is now called SN 1006, a tremendous supernova explosion of a white dwarf star nearly 7,000 light-years away. The supernova was probably the brightest star ever seen in recorded times. It surpassed Venus in the night time sky, only being outshone by the moon. It was visible during the day for weeks, and remained visible to the naked eye for at least two and a half years before fading away. About 50 years ago, radio astronomers detected a nearly circular ring of material at the recorded position of the supernova. The ring was almost the same angular diameter as the full moon. 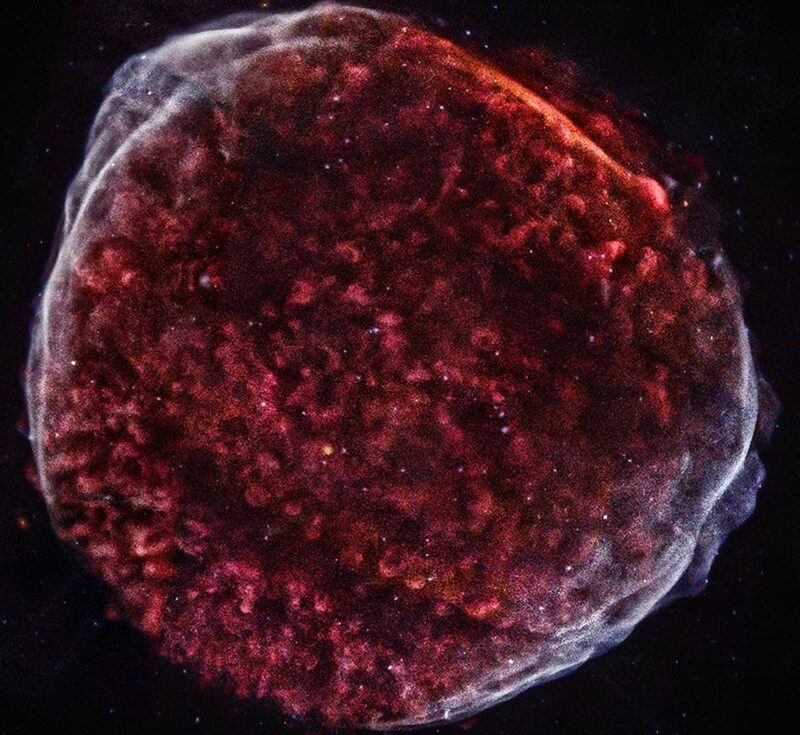 The size of the remnant implied that the blast wave from the supernova had expanded at nearly 20 million miles per hour over the nearly 1,000 years since the explosion occurred. Today, we know that SN 1006 has a diameter of nearly 60 light-years, and is still expanding at roughly 6 million miles per hour. Even at that speed, however, it takes observations years apart to detect significant outward motion of the shock wave. 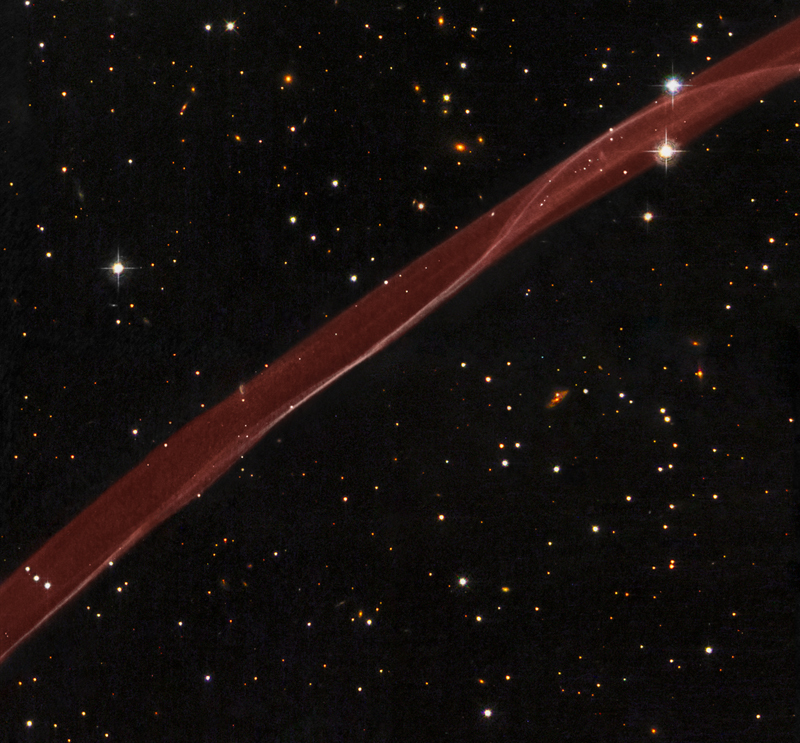 This Hubble image of a delicate ribbon of gas shows a very thin section of the supernova remnant. The location of the 1006 explosion is well out of the farme to the lower left. The shock wave is moving to the upper right.